The First Day of the Great "O"s--Stollen Baking Day! Today we began singing the Great O Antiphons and also began our novena of Masses as a gift of thanksgiving to all our friends and benefactors (this means you!). It's also the day of the Great Stollen Bake when we bake stollen for the doctors, priests and other wonderful people who give their services to us so generously throughout the year. 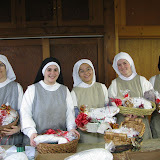 Usually the professed sisters manage to need to stop by the bakery, (read: taste the stollen) and this year we were surprised that Sr. Denise Marie was the sole visitor. Later we found out that Tom, our workman, was waxing the hallway floors and the smell of the paste wax blocked out the smell of the stollen baking! We figure the sisters will enjoy it all the more on Christmas day. Above is a short slide show of some photos. If you click on the photo you can see bigger photos. Now all technology needs to do is invite software so that you can "scratch and sniff" your screen! Do You Know About Giving Cart?